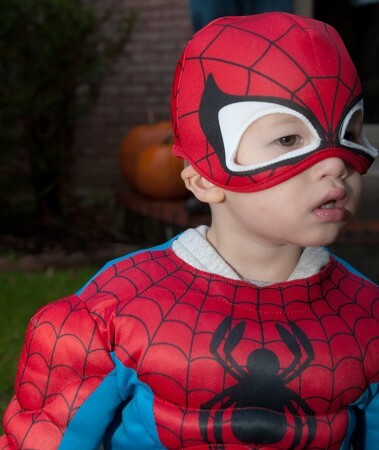 I decided on the superhero theme several months agoand I expected Juliana to veto the idea. 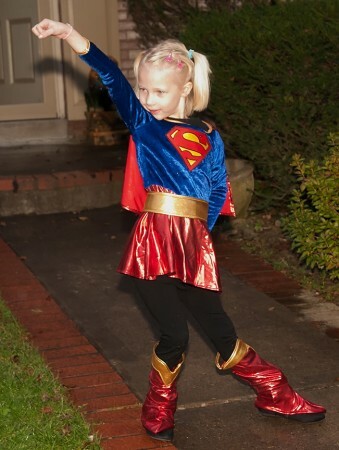 She told me that she wanted to be a super model and I said how about a superhero instead. She thought about it and asked if she would get to wear a dress and then agreed. 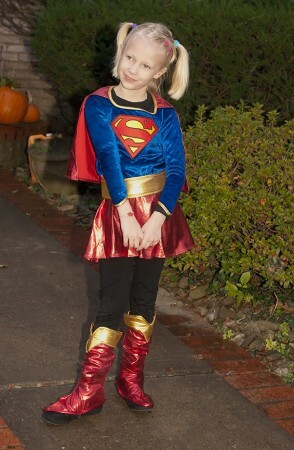 I wanted to stick to the classic characters and Super Girl had the cutest of the girl superhero costumes. 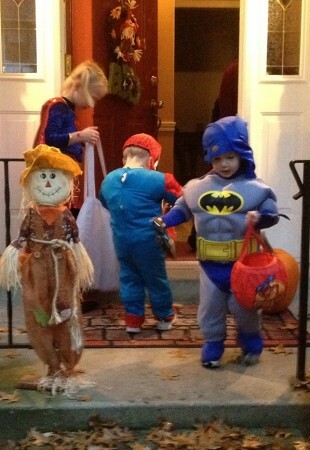 And we decided on Spiderman and Batman for the boys. 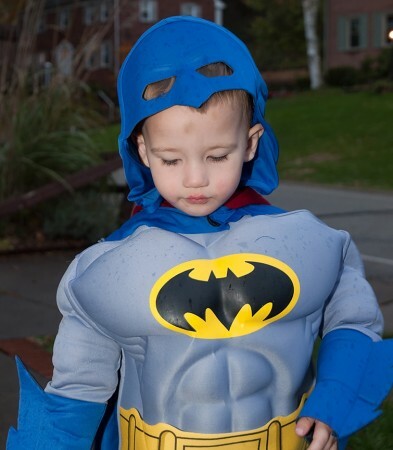 Once the costumes arrived the batman costume fit Wyatt better so that is how we decided who would be who. 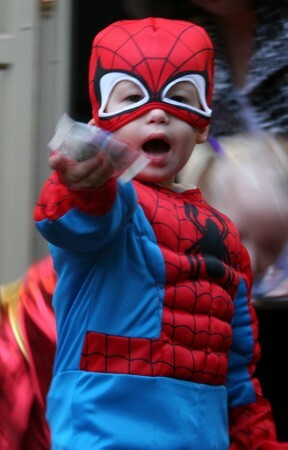 As Halloween got closer, Wyatt would point at their closet and say “I want Spiderman, not batman” so I found Spiderman treat buckets in the hopes that would appease him. 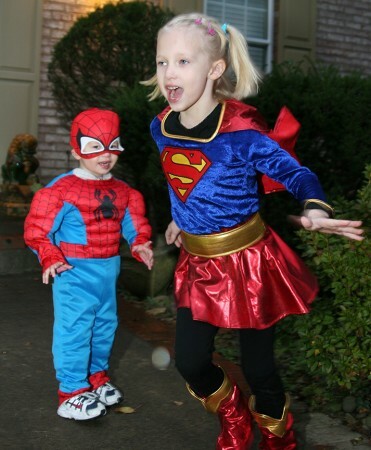 There was some drama when it was time to get dressed but everyone ended up in their costumes. 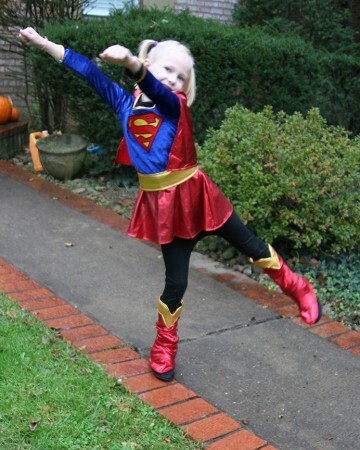 Juliana was happy to pose and there was lots of jumping and pretending to fly. 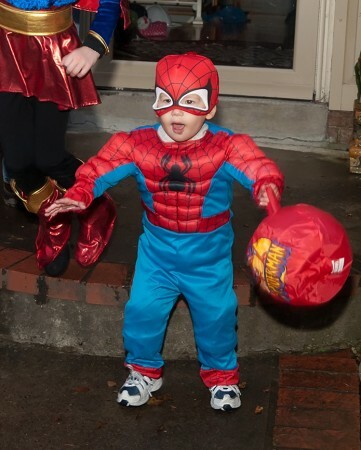 Ruslan loved being Spiderman, he was so happy in that costume and enjoyed every minute. 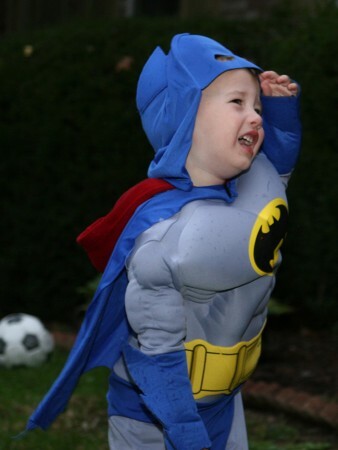 Wyatt had issues with his mask. It was sliding down on his face so he couldn’t see so there was some drama. Eventually we pulled it back on his head and he calmed down. Once the boys were ready they walked to the driveway ready to go. 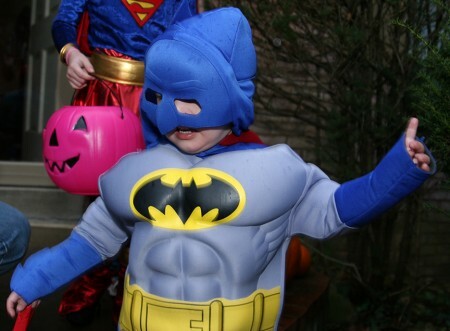 We had practice treat-or-treat at home. 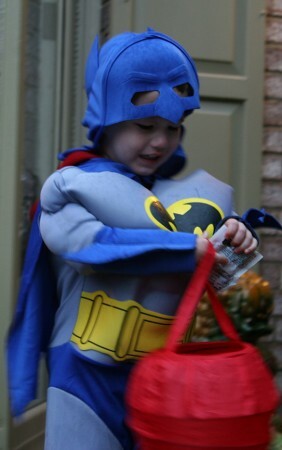 Wyatt was so excited to get a treat (several) and stash it in his bag. Ruslan turned around and yelled OPEN, it took some convincing for him to put it in his bag so we could go get more treats. 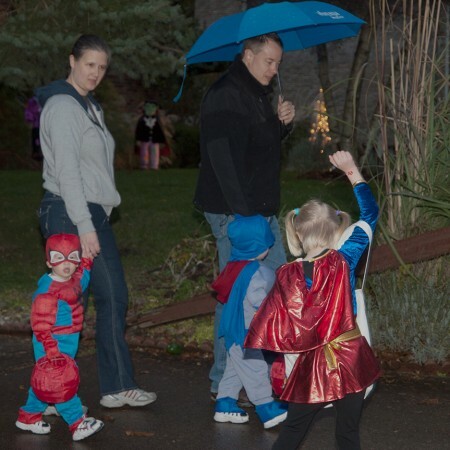 We set off on our street with umbrellas; there was a light rain falling. 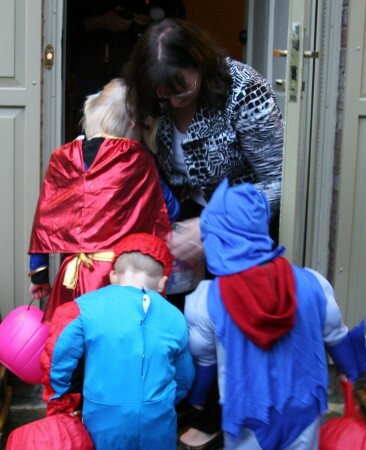 For the first few houses the boys were nervous about walking up to the door. Juliana would run ahead, Ruslan walking with me and Wyatt walking very slowly with Scott. 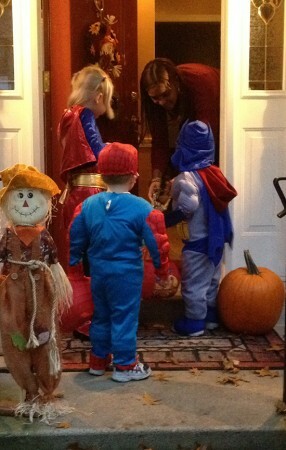 Eventually they figured out that they would get candy if they went to the door. 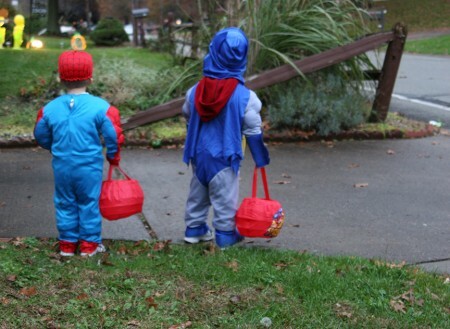 They were most excited when the person would hold the bowl out for them to take the candy themselves. After excited thank yous, they shoved their treats into their bags. So many people handed out bags of chips and the small buckets filled quickly. There is no way to explain that you are trying to help a toddler by removing something from their bag. 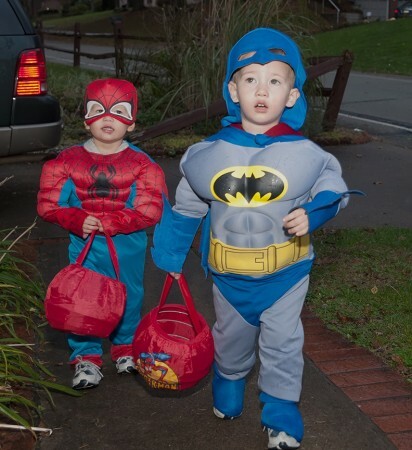 Scott tried to be very sneaky, but Wyatt caught him every time – screaming – so they carried their full bags the entire time. We walked most of the way up our street and turned around to come back. Our side of the street has level entries and the houses on the other side all have 6-10 steps to the front door so the walk back took a long time. We were about 6 houses away from home when it started to rain harder. Juliana grabbed my hand and it was ice. Ruslan had decided he was done walking and Scott finally picked up Wyatt because he was walking so slow and getting wet. 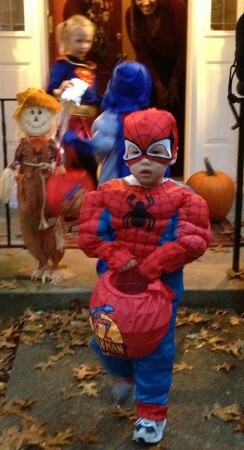 We spent 45 minutes trick-or-treating and the boys did great for their first big year especially with the weather. Ugh. . . amateurs. Buckets??? 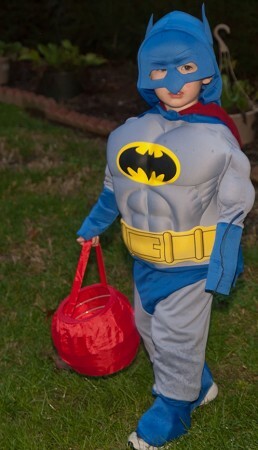 Those don’t hold even CLOSE to enough candy. Next year, pillowcases. Also, I need a muscle suit. ha! we had the same buckets (ours were ghosts) and had the same problem! Next year I will bring a bag to carry the overflow in and to carry the costume accessories that eventually get taken off as we are walking along.